Encounter Contemporary and Richeldis Fine Art are pleased to present ‘Markers’ a significant exhibition of contemporary painting from 11-21st November at 93 Piccadilly, Mayfair. This compelling curatorial project marks the first collaboration between two of London’s leading nomadic galleries and art consultancies. 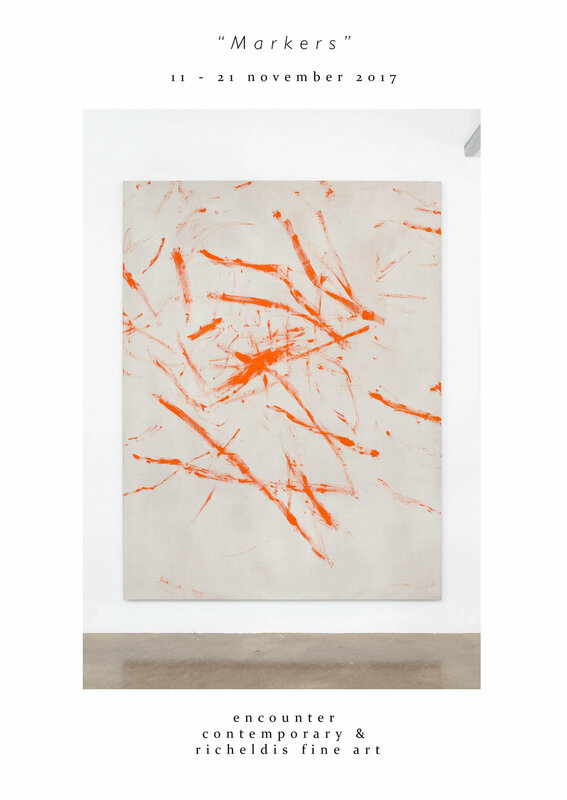 Directors Emma Richeldis North and Alexander Caspari bring together a collection of emerging contemporary painters, each making their mark on the international art scene. Following individual appearances at notable institutional venues such as Kunsthal Aarhus (Denmark), Breda’s Museum (Netherlands), and Lepsien Art Foundation (Germany), ‘Markers’ offers a unique opportunity to view the work of five internationally acclaimed artists at the pivotal moment of their careers. Not simply the question of ‘what’, but ‘how’ to paint has taken on a renewed critical urgency. ‘Markers’ brings together a small focussed group of contemporary artists who are carving out distinct visual languages, which self-consciously and playfully reference the weighty history of painting, whilst continuously interrogating new spaces of inquiry emerging on its periphery. The varied and innovative processes of artistic production each employs have become important sites for critical investigation in themselves. Williams tears and stains un-stretched canvasses before reconstructing them into refined compositions, the result is nuanced works, which in their very materiality complicate the perceived edges of the painterly frame. In his pared back monochromatic studies, Janssen skilfully traverses the intimate line between minimalist composition and expressive mark, creating meditative works that continuously tremble on the edge of movement. After deconstructing found images and patterns through digital printing techniques, Davies then painstakingly refigures them on canvas, a multifaceted process of layering and overlapping, adding and subtracting, which at every step problematizes issues of authorship and image-production. Through his use of industrial materials such as tar, fibreglass and acid, Kragelund’s striking coded works both preserve and attack the object-hood of painting. And while their raw materiality clearly dialogues a post war European approach to making, their charged conceptual underpinning remains thoroughly rooted in the present. Teague’s unique visual language at once consciously and unconsciously addresses issues of painterly process, the minimal yet erratic gestures which drift across his canvasses are precariously balanced in an ambiguous position on the edge of restraint and release. Despite emerging from fundamentally different creative trajectories, at play in each is a shared sensibility for creating multi-layered objects, which at once disguise and reveal the physical and conceptual labour through which they have come into being. The work scrubs out the pictorial and explores what’s left. At the core of the show is a conflicting impulse between accumulation and erasure, a delicate balance between intuitive gesture and deeply considered subject. “Markers” will run from 11th to 21st November. This powerful exhibition marks the coming together of a dynamic group of artists and curators and is certainly not one to miss. Z H A N G Untitled Mixed media on canvas @richeldisfineart artist Emma Zhang minimal paper and oil layered canvases / DM for full collection and further details "For me, a lot of thoughtful, complex things will be avoided, and I think it's better to be simple and pure, and pull away from the so-called "meaning" of artistic expression.Critics always like to make art complicated, in fact, the artist is very simple when he/she is painting, sometimes he/she doesn't even think about it too much, painting sometimes is a kind of feeling, you choose one of your favourite way of your life, and you're used to it. For interpretation of contemporary art , I always feel a piece of work is not able to illustrate it, must be in a series, the expression of the artistic viewpoint can be gradually clear and complete."